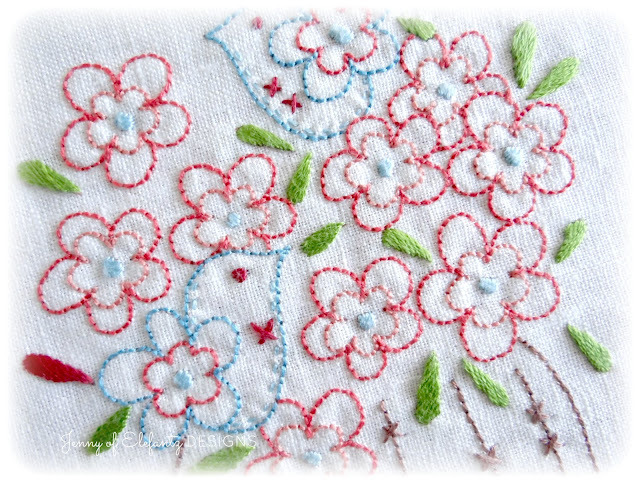 There's lots of flowers, pretty birds and a vase in this stitchery - things I love. 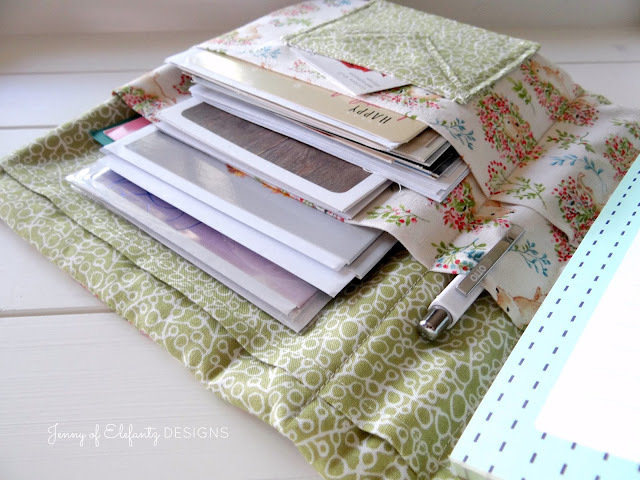 Along with the stitchery this month I've included instructions to make a small mini quilt display, just in case you'd rather that than a larger quilt. You'll see in the pattern that it's been designed to allow you to change the stitchery each month. 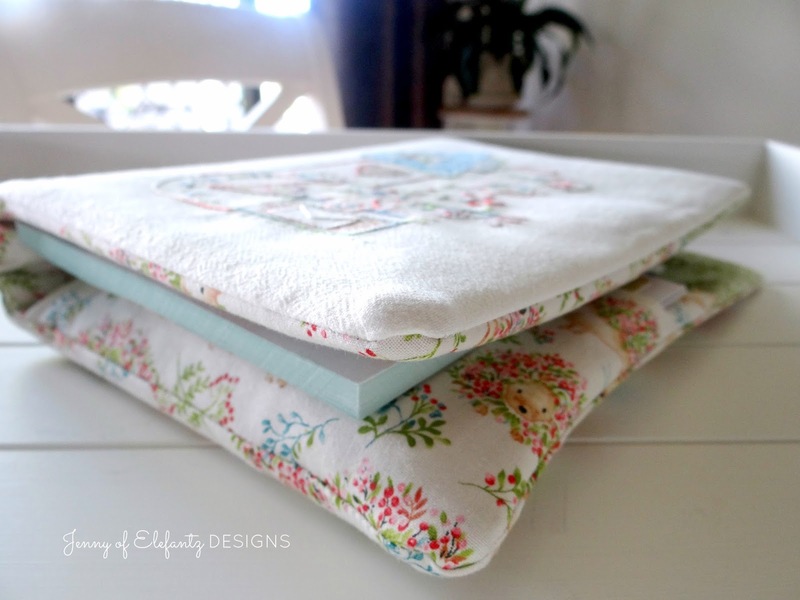 The stitchery is made into a small bound quilt, and hangs on the slightly larger floral quilt background. I wonder what you'll choose to make - the mini quilt display now or wait until December and sew all twelve blocks into a larger quilt? The Block 2 pattern is free during the month of February but will become a $2 purchase when the March pattern is released. One of the things I plan to do this year is design more projects with a purpose in mind. One of the patterns inside the February issue of The Stitchery Club is called 'Writing Letters' and my inspiration for it came from a desire to correspond the old fashioned way with family and friends near and far and to send encouraging cards with small gifts inside (such as these bookmarks or lavender sachets) for no particular purpose other than to put a smile on a special someone's face. As I prefer to keep everything in order and have been making this a priority in 2018 it seemed wise to make myself a useful (and pretty) compendium to hold a paper pad, assorted cards, envelopes, stamps and a jolly good writing pen, if I were to regularly attend to my postal purpose. The Writer's Compendium has three large pockets for storing cards and envelopes of various sizes, and the notepad slips into one as well. There's also a envelope shaped pocket for holding packets of stamps. My friend Rosie is making one as well, which is wonderful because she became my pattern tester. When I first told Rosie about my intentions for this project she was as excited as me and so as the design came together in my head, then in fabric and thread, I passed the instructions along to her. I'm sure she will have her own compendium finished any day now. It's such a blessing to have a friend who 'gets you' . 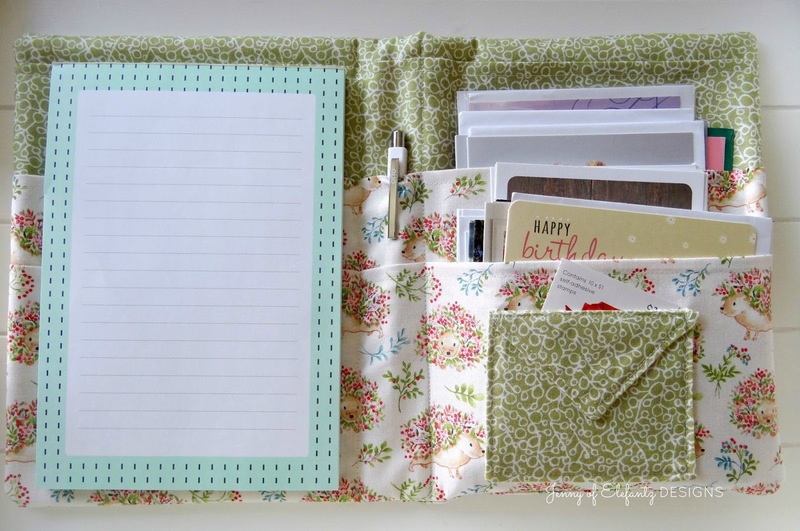 It holds quite a lot, which is great because I can keep an assortment of cards together to cover most occasions. As I've shared in previous blog posts through January, planning for and organising the various areas of life which matter most is a priority this year...in fact, in a way this year will become a blueprint, regularly being tweaked, for the years to follow. My desire to keep in touch with family and friends more regularly by personal correspondence, instead of the usual email and text, is one of those areas which means a lot to me, and I hope that just as I've designed this compendium to be pretty and useful, more ideas for projects which have a purpose will find their way into my sketch book in 2018. I'm including a pattern to make The Writer's Compendium inside the February issue of The Stitchery Club (find out more here) but it will also be added to my shop on February 17th as a single pattern purchase (including the stitchery) for non-members. Have you made some headway with planning this year? Are those plans making life easier? I'd love to hear how you're going with this. I'm off to the hospital tomorrow with Blossom for her 36 week visit. Not long now until we meet our new grandbaby. Blossom is in still in a great deal of pain (increasingly, actually, due to her scoliosis), but very grateful bub has made it this far. Your prayers for a safe, gentle and doctor-attended delivery would be most appreciated. What a wonderful idea this writers compendium. I am going to make one myself when I have finished some projects. I really adore the hedgehog fabric. So cute. Where did you find that! There is one thing I am going to do different in the compendium. As I am righthanded I like my notepad on the right side of it. It's easier to write on it. But for a leftie it should be on the left side I guess. Thanks for the beautiful pictures and story. I like the compendium. It looks really practical and pretty. We are birthday month buddies!! A lovely project. I also am a February gal. Love the compendium. Too pretty. I like your sweet February block too! 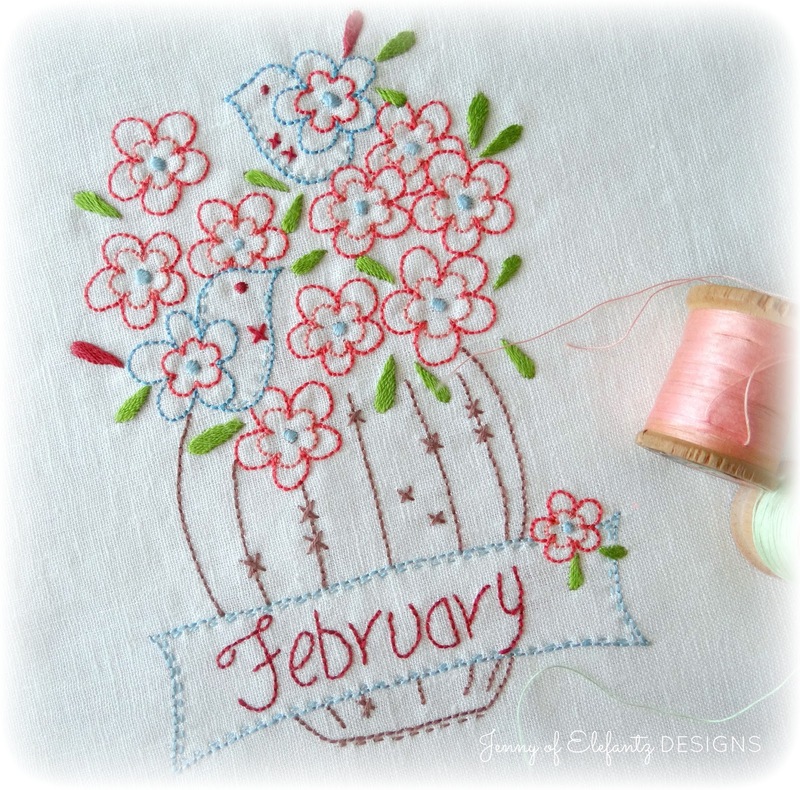 Totally thrilled to see February's embroidery with the tweeties and pretty posies! Despite a a late start with Miss January I put the final stitches into it last night. February's will get started this weekend. Thank you for sharing your patterns with us. This is so pretty. I am making a plan to make the compendium for a friend's birthday. Plenty of time to get this finished. 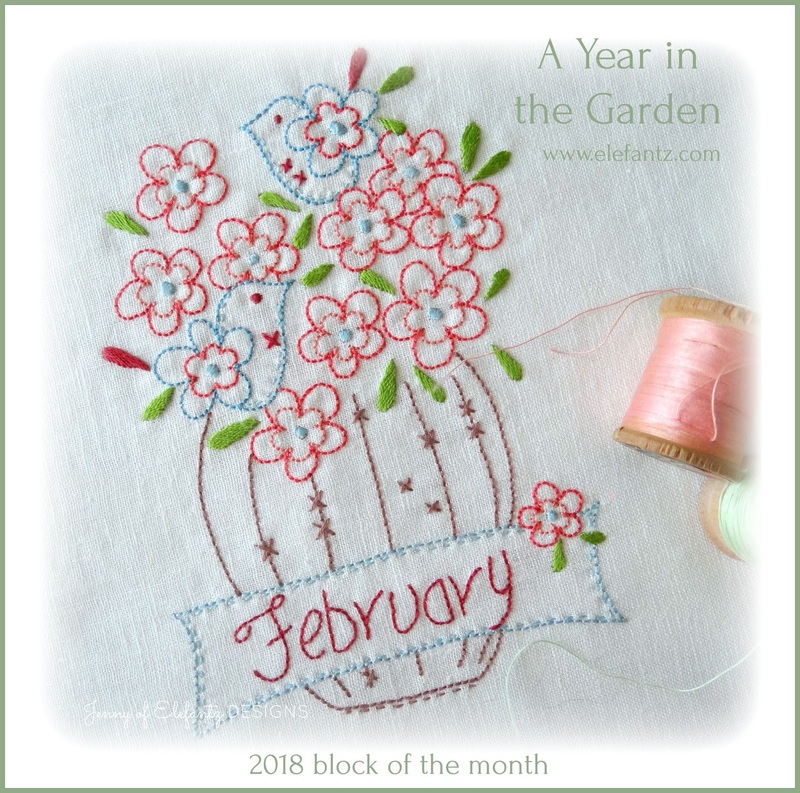 I love the idea of having a mini quilt for each month of the year. I’ll probably find myself a pretty hanger at my quilt shop and use that to display them. I also love to correspond the old fashioned way and have a pen pal that I write to and exchange small gifts with several times a year. Maybe we should set up a pen pal group for our gentle ladies. I know a few who have expressed their desire to do this. Thank you for another beautiful design. Im willing to be the pen pal coordinator if e erroneous likes the idea. Let me know, my email is grace16 cat@ Gmail.com. I really like the small quilt idea for each month. That will probably be the way I go since I like to change up my decor now and then and this offers a way to do it monthly. I also really like the writer's compendium idea. May have to think on that one and decide if I have the time to do it. Thanks again for sharing your talents and encouragement to fill our homes with all aspects of beauty. Hello Jenny; My prayers will surely include Blossom and the baby. Plus, the remainder of the family as they ; also need strength and guidance during this time. Jenny, I do not think that I have revealed to you how infatuated (I even looked up the definition to make sure my forgetful brain was not playing tricks on me...LOL) with your embroidery bird I am! That darn cute little creature has truly caught my attention and most surely my love of embroidery and YOU do feature the little creature on so many of your projects; how could I help but not fall in love with it. So tell me, it this little adorable bird a Boy or a Girl or do you consider it both and have you given it a name? I love the Feb. project and am looking forward to stitching it! 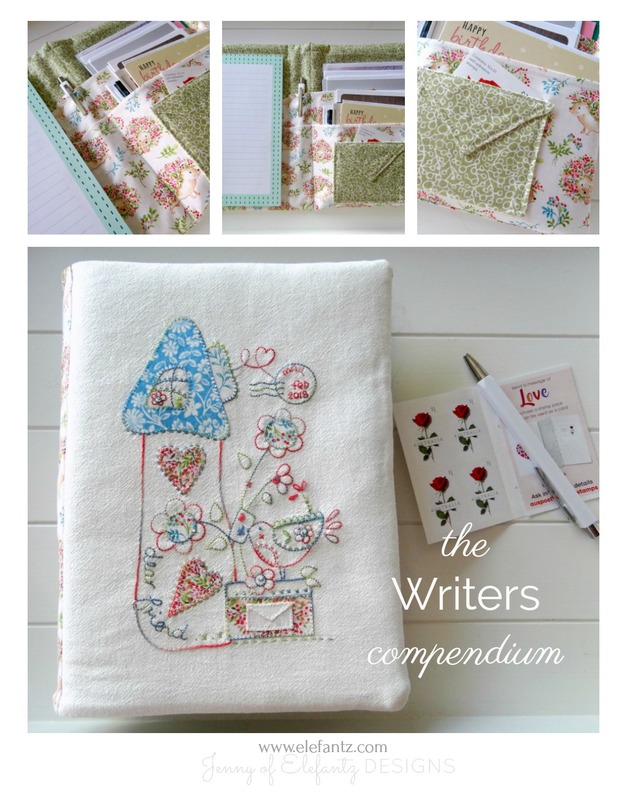 Plus, the Writer's Compendium is such a fabulous project you have designed. Thank you for sharing and have a great day! Thank you- I just wish I could find more time to do these projects. 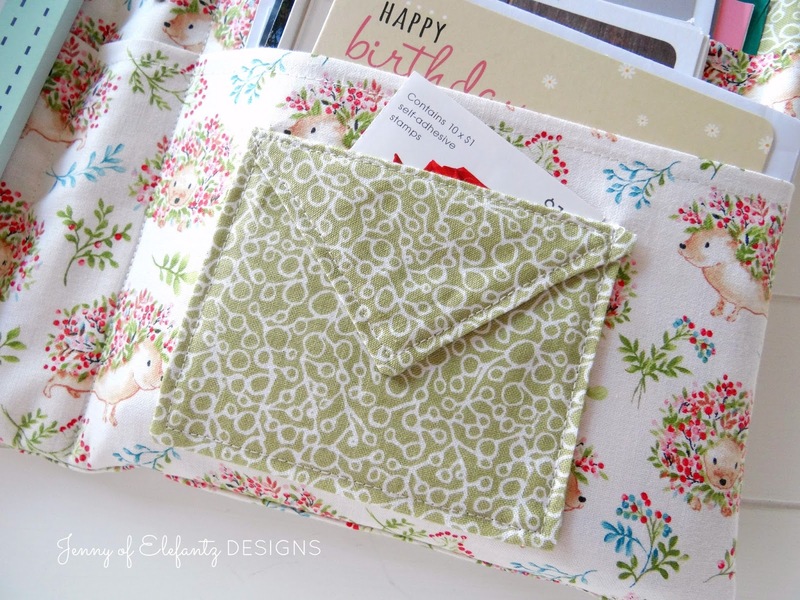 I made your sewing kit recently for a friend but didn't post a pic yet on instagram as I haven't seen her to gift it. Many prayers for sweet Blossom and her new baby. I love the notebook. I have all my cards and stationary in a plastic bin but you have given me inspiration to do something different. 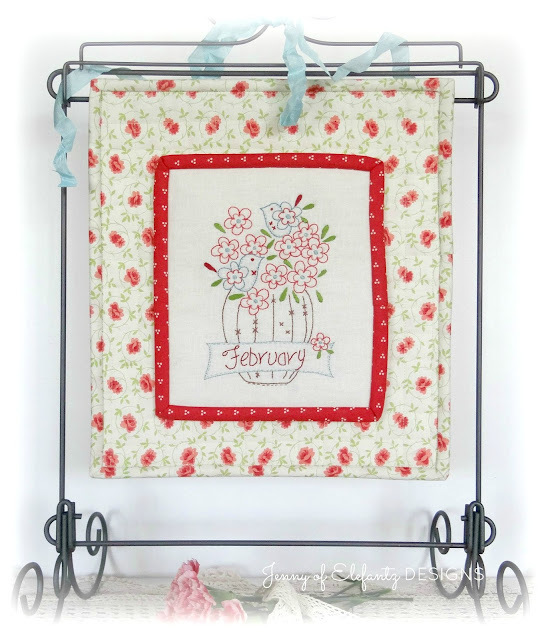 Love the February block, so gorgeous - and that incredible compendium!!!!! That is truly amazing!! Praying for Blossom and baby - and Cully May and grandma too! I love your Writer's Compendium and the cute Hedgehog fabric. I, too, still love to send cards in the mail. I've been doing to for over 40 years, so I'm drawn to your Writer's Compendium. Can you tell me the name of the fabric? Hi Jenny, I'm praying for you and Blossom this afternoon. May God hold you both close. 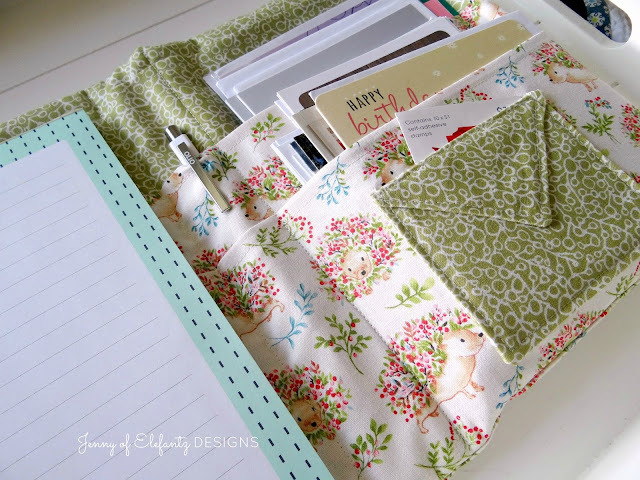 Could you tell me what that little stand would be called that you are displaying your quilt on? I would love to look for something like it. 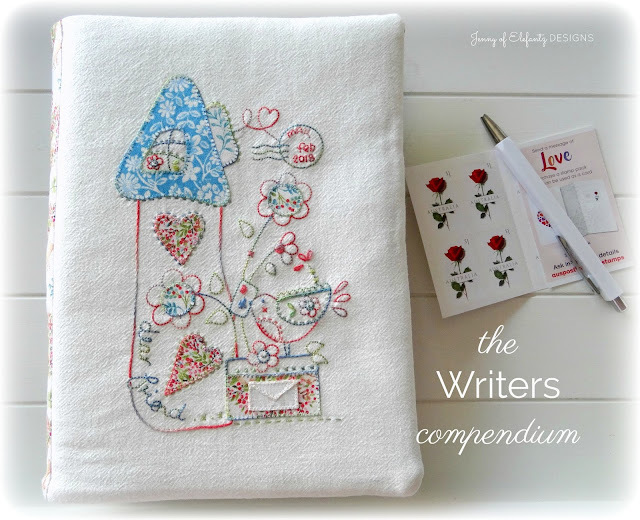 How lovely is that compendium! Love February stitchery. Mine is proudly displayed. I still had January's design ( a table runner) on my table for the 1st couple of days of Feb lol and still had Dec stitchery displayed. It had been a crazy week lol. I am having trouble downloading from Craftsy. Is there any other way to get the free pattern? No Mary, only through my Craftsy Shop. Have you logged in to Craftsy? Did you put the pattern in your basket/cart?